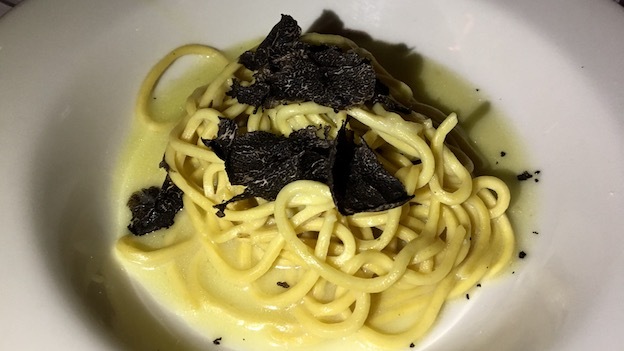 Taglierini con Tartufo Nero; in house hand made fresh thin ribbon shape pasta with fresh Alba black winter truffle. Trattoria Carpaccio is one my most delightful finds of recent years. This small, neighborhood restaurant captures an intimate atmosphere that is increasingly rare in today’s world of large, corporate restaurants. The small dining room is cozy. A soundtrack featuring Eros Ramazotti, Laura Pausini and a host of other Italian pop icons sets the mood. Close your eyes and you will feel as though you just walked in from a small side street in Rome. I first met owner Elvis Jadrijev years ago when he was the General Manager at nearby Grissini. At Carpaccio, Jadrijev presents fairly classic dishes that showcase what Italian cuisine is all about: ingredients. The sautéed shrimp, burrata and tomatoes and Dover sole are all divine. My favorite dish is the veal parmigiana, which is superb. One of the many virtues of Italian food is the neutral canvas it provides for wines. That is very much the case on this night. Roederer’s 1995 Cristal Rosé gets the cocktail hour started in style. Delicate and beautifully perfumed, the 1995 speaks to grace above all else. In some vintages, Cristal Rosé can be quite vinous. The 1995, on the other hand is quite subtle. 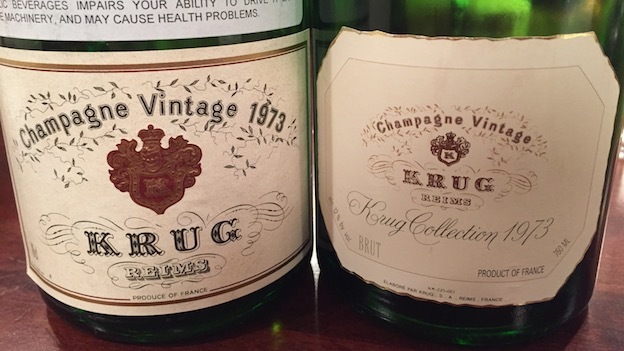 It is always illuminating to taste the original release of Krug’s Vintage Champagne next to the late release. For this informal tasting, the bottles were covered so as to remove any preconceived notions about the qualities of the two wines, but that turned out to be an unnecessary exercise, as it was plainly evident to all which wine was which. Elegantly burnished by the slow passage of time, Krug’s 1973 Vintage is now fully mature but at a glorious peak of expression. Apricot jam, honey, spice, hazelnut and orange zest show off the Krug oxidative style at its very best. The 1973 is rich and creamy in the glass, with fabulous depth and resonance in all of its dimensions. I don’t see much upside from cellaring bottles further, although the 1973 is likely to drink well for at least another handful of years to come. Tasted next to the Krug Vintage of the same year, the 1973 Krug Collection is a real head-turner. Extended time on the lees has resulted in a slightly reductive character that adds notable complexity as well as freshness. And that is the key word on the 1973: freshness. Lemon confit, white flowers and orchard fruit all take shape in the glass. The Collection is more linear in style than the Vintage, with very few, if any, of the oxidative notes that are found in that wine. Invigorating and refreshing, the 1973 Collection is utterly irresistible. Readers lucky enough to own it can look forward to another decade or more of pure drinking pleasure. The 1989 Cristal is wonderfully translucent and nuanced, with lovely brightness to its orchard fruit, mint and sweet floral notes. The 1989 speaks in articulate tones. Today, the 1989 is tightly wound and not fully expressive, both of which suggest it may still need time. This is an especially reticent bottle of the 1989. 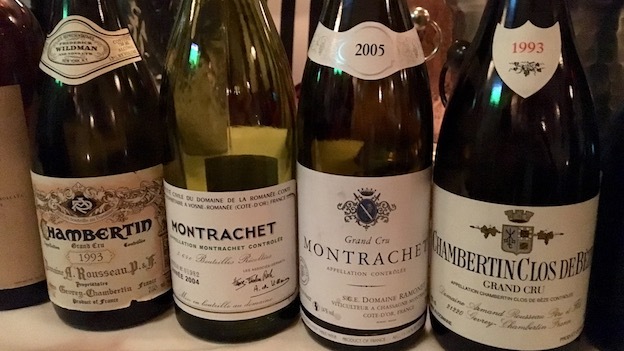 2004 Ramonet Montrachet is a bit better than the 2004, although, quite frankly, at this level, I expected more. Nevertheless, the 2004 has held up well and still offers good freshness for a wine of its age. The slate, orchard fruit and floral notes are attractive. The 1989 Richebourg from Domaine de la Romanée-Conti is terrific. Intense dark flavors are given an extra kick of aromatic intensity from the whole cluster, with beams of tannin and plenty of Richebourg vertical structure to back things up. Mint, dark cherry, sage and lavender add shades of nuance, while bright, saline notes punctuate the finish. What a gorgeous wine this is. The 1969 La Tâche is very pretty, even if I have had better bottles. Exotic spice, hoisin, soy, hard candy, blood orange, white pepper and wild flowers give the 1969 much of its eccentric personality. There is very ripe, almost candied quality to the fruit that is quite distinctive. It’s hard to move away from the 1969, as it is a wine of total allure. It’s always illuminating to taste the two 1993 Rousseau flagships side by side. The Chambertin-Clos de Bèze is stellar. Translucent, deep and wonderfully expressive, the 1993 is utterly magnificent on this night. Orange peel, rose petal, red fruit and exotic spice give the wine much of its complex, beguiling personality. The 1993 Chambertin is very slow out of the gate, and is really only at its best after several hours of air. Over time, the gap between the wines narrows as the fruit begins to emerge and the tannins gracefully soften. Even so, in this vintage I prefer the Bèze. Roumier’s 1993 Bonnes-Mares follows. I doubt the 1993 will ever be especially refined, as it is still a tough and decidedly virile Burgundy. Scents of tobacco, smoke and plum open up in this broad-shouldered, muscular wine. Bruno Giacosa’s 1969 Barbaresco is one of the surprises of the night. About ten years ago I had an opportunity to buy a very large cellar of Giacosa wines. In it there was a case of the 1969 Barbaresco. At the time, I knew nothing about the wine and only had a general sense of a vintage before my time that was not very well regarded. Every bottle of Giacosa’s 1969 has been terrific. This bottle, my last, was the best. The 1969 Barbaresco is not an epic wine by Giacosa’s standards, but it is glorious tonight, especially with the taglierini with black truffles. Sadly, a bottle of the 1982 Conterno Monfortino is not good. There are no visible signs of damage, but either poor storage or a less than perfect cork resulted in a wine with oxidative notes that are especially evident in the bouquet. What a privilege it is to taste the two 1959 Bordeaux. From the moment it is opened, the 1959 Lafite-Rothschild is simply mesmerizing. Silky, intensely floral and nuanced, the 1959 is a wine of intoxicating beauty. It is as profound as a wine can be on this earth. The 1959 Latour is bigger, richer and more ample in its feel, with soft contours and yet plenty of tannin. When the wines were first opened, they were quite different, but, interestingly, over time, the two wines began to converge. Perhaps that is the personality of the vintage speaking. In any event, both 1959s were utterly thrilling. 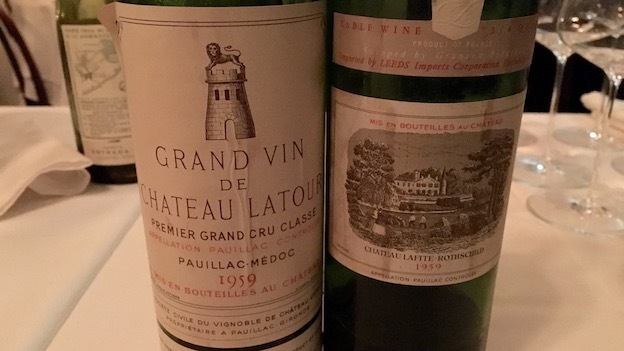 There is no doubt in my mind the 1959 Lafite and Latour will be both stunning at age 100, if the corks hold. The 1985 Leroy Chambertin is a sensual wine with no hard edges and terrific overall balance. The mid-weight, nuanced style stands in stark contrast to the Chambertins Lalou Bize-Leroy makes today from estate fruit. Even so, the 1985 is quite pretty. It’s a school night, so dinner wraps up early with cookies and coffee. 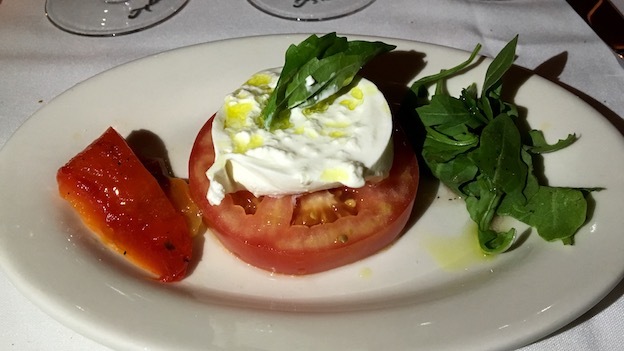 Readers who have an opportunity to stop by Trattoria Carpaccio should not miss it. One thing to note: Carpaccio does not have a wine program, it is strictly BYOB. I am already looking forward to my next dinner.